Cool! Save an average of 20% on Let-It-Rain with 8 Coupon Codes, and 2 Deals! Let-It-Rain is your online source for quality rain gear. 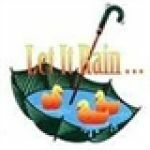 The store offers a variety of fashionable and functional women's and children's raincoats, rain boots, and rain accessories, plus umbrellas for all. All products are water resistant or waterproof to keep you dry. Details: Get 10% off on purchases of $50 or more. Details: 10% off great brands of Mycra Pac, Ilse Jacobsen, Western Chief, Hatley, Joules & more.